Brielle Buchberg and Lindsay Segal, the women behind Luxury Garage Sale, are known for taking the Chicago upscale consignment market by storm and for orchestrating the best designer pop-up shops in the city. They have a great eye for designer goods and always seek out the optimal way to sell their customers’ consigned goods (eBay, pop-up shops, auction houses, etc.) to obtain the best resale value. 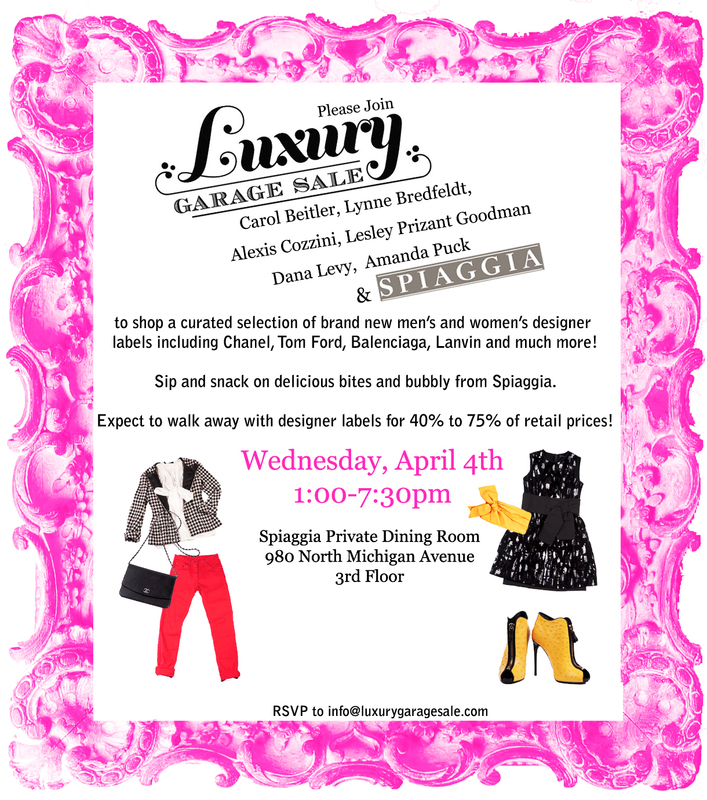 On April 4, Luxury Garage Sale will team up with the ever-so-swanky Spiaggia restaurant and a list of local taste makers to host their first shopping event of 2012 and provide shoppers with new high-end designer goods at a fraction of the price. Clothing and accessories from some of the most coveted brands in fashion (Chanel, Balenciaga, Lanvin and more) will be available at 40%-75% off retail. And if that is not enough to entice you, Spiaggia will be providing hors d’oeuvres and drinks to give attendees a taste of the fine dining they have to offer. So, round up your shopping buddies and get your pocketbooks ready for an unforgettable day of shopping! Just make sure you RSVP. We wouldn’t want you to miss out on anything. This entry was posted in Shopping and tagged Luxury Garage Sale, Spiaggia. Bookmark the permalink.